Get it? Because it’s Luna and it’s also Nutty…? Too much pun? 1 coat of Revlon Quick Dry base, 2 coats of Zoya Celine, 1 coat of NYC Grand Central Station as top coat. Celine is a berry jelly with decent coverage. Under natural lighting VNL wasn’t bad, but people with longer non-nubby nails may be more bothered by it. The color itself is very fall-like. It dries a bit deeper in color than what you see in the bottle, which I personally like. Sometimes this kind of color can look a little dated, especially when it’s sort of muted and ‘dusty’, but this one was vibrant and fresh. It was kind of like a grape juice stain on white fabric, which is prettier than it sounds. 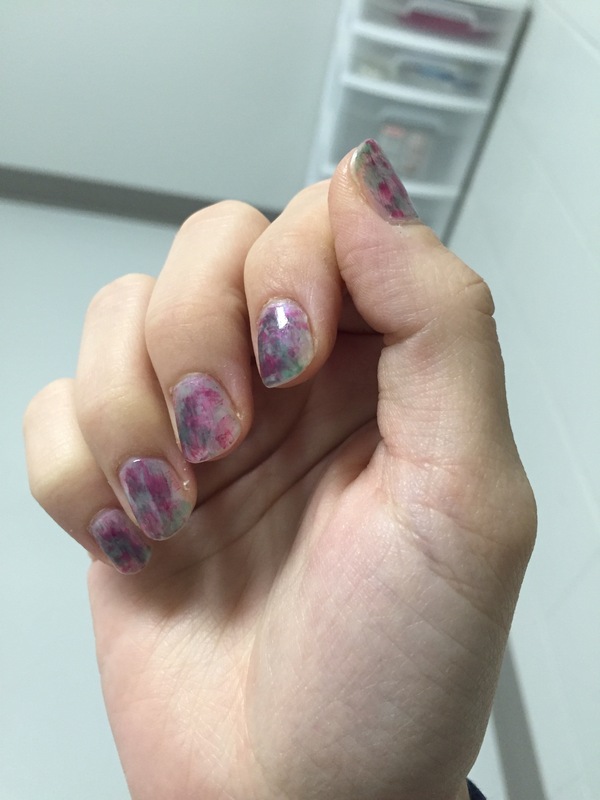 I got about five days with moderate tip wear and very minor chipping. Decent wear time, but I noticed some slight cracking on the nails that tend to bend or that get a lot of stress. So the first round of Use It or Lose, many moons past, was an attempt at a mini “Project X-pan” to help me finish up stuff I wasn’t using. The problem with the first approach – selecting products that I had to use until they were totes gone – was restrictive and not fun. 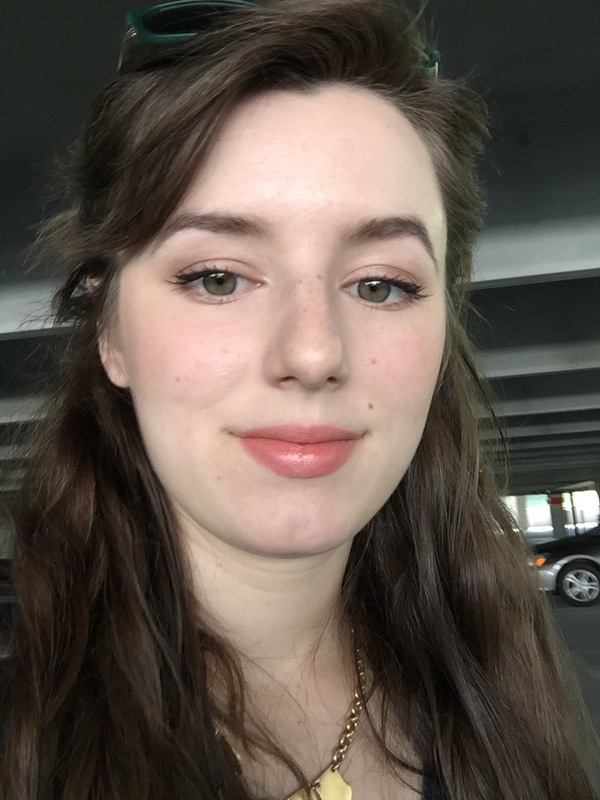 I felt constrained by filling a makeup bag with a few items that I had to use EVERY DAY and I think making a goal to finish the ‘losers’ is more motivating than restricting myself to the same face every day. I like goals! Especially achievable ones. Even more so when I can pretend I’m vanquishing foes. I do not have pictures for all of these items because some of them were so bad I just wanted to trash them as quickly as possible. Oh well! Rimmel Stay Matte pressed powder (Translucent and Sandstorm): it’s not a perfect, all-day mattifier (at least not on my angry pregnant greasepit skin), but for only costing around 4USD it is pretty darn good. I like how easily it blends into my skin without making me look chalky and matte. I think my biggest beef with this product is the packaging. The older container had a pseudo-screw top that used very small beads of plastic as the stops. These wore down so quickly that I had to baby the powder whenever I traveled with it, which is pretty frequent since I often do my powder in the car :X The newer packaging is a bit better; the lid is a pop-on style that stays put pretty well as long as it’s kept in a makeup bag. I wouldn’t feel confident in its staying ability if it were thrown straight into my work backpack, but when it’s lovingly ensconced in a small zip-top cosmetic bag it feels pretty safe. BUT. Still not ideal. Other bonus: the shades aside from Translucent leave a tint, so if you want something to help reduce redness or uneven skin tone this may help. My face is lighter than the rest of my body and Sandstorm helps bring a hint of color to my face without looking orange or dirty. Repurchase? Yes. As I age I may transition to a powder that has better light-diffusing properties, but for now this is a solid setting powder. Jordana lip products (Easy Shine and Twist and Shine): Wonderful scents, lovely application, delightfully moisturizing. The Easy Shine sticks were sort of a highly pigmented lip butter/lipstick hybrid. The Twist and Shine sticks are very similar to the Revlon Balm Stains, so much so that several colors are near-exact dupes for the Revlon colors. I haven’t used any of these up because they’re quite pigmented and leave a nice stain that just about gets me through the work day. My only quibble is that the Easy Shines tend to migrate a bit due to how buttery they are, so they take a little maintenance. Repurchase? Ehh, probably not. I have so many lip products that I need to work through and I’m finding myself preferring less exotic and lower maintenance colors lately because they’re easier to take care of during the day and they don’t stain my kids’ faces quite as badly when I kiss them. Simple toner: oh mah goodness I love this stuff. I’ve gone through a bottle and it was wonderful but I’ve been trying different toners lately (more on that later). It’s not an astringent toner; it’s gentle and soothing on irritated skin. When I have razor burn on my legs, mild sunburn/dryness or sore cystic acne spots this does the trick of relieving the hot, burny sensation and making everything magic again. It just feels so good. There’s also a light, somewhat herbaceous scent that I’m really enjoying. I feel kind of like I’m at an old-timey apothecary. Repurchase? Maybe. I’ve also used a bottle of Avalon Organics toner, which is magically orange scented and equally mild and refreshing, and I may try to mix my own witch hazel/aloe toner, but this one will always be on my mind. Olay Complete Daily Defense moisturizer (sensitive skin/SPF 15 formula): a nice, basic moisturizer with no scent. I like that it doesn’t burn my skin AND offers sufficient moisturizing power without leaving a film on my skin, and it’s great for both day and night. It’s light enough for the humid summer months and usually it’s My husband loves it for the razor burn he gets on his neck, so that’s a bonus. The only things I don’t love are the relatively low SPF (I’d love to see SPF 30) and the fact that Olay/Procter and Gamble is not a cruelty-free brand. Repurchase? Yes! If I find a comparable cruelty-free alternative I’ll abandon ship, but until then I think I’ll stick to old reliable. Aussie 3 Minute Miracle Moist Deeeeeep Conditioner: ohhhhh this stuff smells amazing! So fruity and NOM. I have somewhat fine-textured hair, but I have a lot of it—that is, each strand is rather thin and soft, rather than being thick or coarse. I don’t do heat styling or any hair coloring so it doesn’t take much to keep my hair happy; the biggest thing is that keeping it conditioned has helped prevent breakage from rough treatment (since I tend to shove it under a hard hat or into a ponytail when I’m at work). Also, THAT SCENT. Repurchase? Once in a while. I’ve switched to primarily using coconut oil since my hair doesn’t really need the extra protein from the heavy duty store-bought conditioners. It’s only around 4USD at most stores, so it’s a cheap pick-me-up. Neutrogena T-Gel: this one may be kinda gross, but I’ve had some wacky scalp issues at least since I hit puberty. Whenever I washed my hair my scalp would burn and develop raised welts. It was kind of like some weird head eczema. I hated it. I hated shampoo. I hated having my head touched or my hair cut. I tried T-Gel at my little brother’s recommendation because he’s had similar issues and OMG magic. After the first use the symptoms were GONE. I love that my head doesn’t hurt after I get out of the shower and the scalp dryness and flakiness has diminished drastically, and I LOVE love that I don’t have to avoid wearing my hair down due to the flakiness. This product does contain coal tar, which can be a health concern for some people and is considered a carcinogen when consumed in large amounts, so I’m looking for alternative ingredients that will have the same effect. Repurchase? yes, unless I find a coal tar-free alternative. Milani Eye Tech liquid eyeliner: This marker-style liner was way too firm for me to get a smooth application, it takes a while to dry, and the applicator gets SO MESSY because product oozes out when the tube gets shaken… which is how you get more product into the tip… which is stupid. Mine dried out fairly quickly, but I also used it infrequently and had it for 8 months? Maybe? So I’m sure that hasn’t helped its lasting ability. Finish? Already have, and I’ll never buy another. I’m sticking to my beloved Physician’s Formula Eye Boosting thingy. 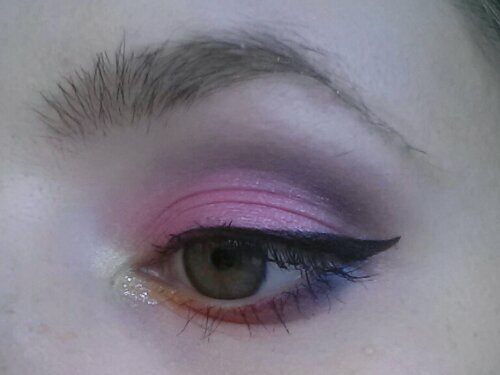 Hard Candy Moonglow powder: I just can’t do this anymore. I tried for so long – like several yeeeeears – to make this work. I wanted this to be a smooth, glowing powder, and I found that (for me) it was more of a pale glittery setting powder. It also made my skin feel itchy and warm, so that wasn’t very pleasant. Into the trash with this bad boy. Finish? No. I like my setting powders matte and my highlighters less chunky-glittery. Benefit They’re Real! : Yes, they’re real, and holy cow were they clumpy. I’m not a fan of waterproof mascaras and this one was a horrible hybrid of waterproof and NONwaterproof—all the smudging power, but incredibly difficult to remove. I am a lazy person and I generally stick to makeup that can be easily removed by my beloved L’Oreal 360 Clean (sensitive skin formula). On top of that I didn’t have much luck getting everything off with straight up oil, either. Usually some coconut or olive oil will do the trick melting mascara, but no dice here. If I had about 8 minutes to spend on my eyelashes this was a beautiful, dramatic mascara to use, but most days I don’t have extra minutes to spend leaning over the sink trying to poke my eyelashes apart with a spiky mascara wand. Thankfully this was a free sample from Sephora for my birthday, so no guilt for throwing it away. Finish? NO. I’ve lost too many eyelashes to this tube of demonseed. L’Oreal toner: meh. Just… meh. I like that it’s not drying but I haven’t noticed any skin-brightening or smoothing effects from the beta hydroxy acid or B vitamins. It may be a low enough concentration that one application a day isn’t enough to make a difference. The only thing I’ve noticed it really being useful for is removing any smudges of skin makeup that I didn’t get with my face cleanser. I just think I prefer toners that contain soothing ingredients like witch hazel and aloe. EDIT: I’ve noticed that it sometimes burns my skin when I use this before nighttime moisturizer. Out it goes. Finish? Yeah, I guess. Nooooope. See added comment above. Aveeno Positively Ageless Youth Perfecting Moisturizer: it has a lovely, plush texture and a mild scent, but it burns the skin along my cheekbones, isn’t sufficiently moisturizing for my combination skin now that the weather has dried out, and if I apply a little too much it develops an odd greasy film that pills up easily. I feel like I have to be careful when applying this just so I don’t have to worry about it leaving weird lumpy bits on my face. And, you know, it burns. Garnier Sleek and Shine Moroccan Oil for hair: The simplest way to describe this product is “disappointing”. I have long hair and love using easily absorbed oils (argan, moroccan, coconut, jojoba) as a sort of leave in conditioner, so I was excited to find this hair oil on sale when I was out and about. Unfortunately the Garnier product has so much dimethicone and silicone that I can’t tell if it’s making any difference to how well my hair resists dryness. The other problem with this is that it actually leaves my hair pretty flat when I use it, and I’m mildly concerned that it’ll start leaving a heavy buildup. Gross. Finish? Yes. This stuff smells amazing, and when desperate I can use a little on my legs right out of the shower since it kind of forms a seal against moisture loss. On Saturday I figured I’d try doing some nail art, because sometimes you just want to let loose and so the wild things in life. I thought I’d do a dry brush manicure because it’s touted as being soooooo easy. Unfortunately dry brush/distressed polish is surprisingly difficult to get right in spite of the fact that the actual technique is simple. I think I’ve narrowed down where I went wrong. I’ve made mistakes so you don’t have to! Let’s keep it that way, thx. 1. I used sheer colors for the actual brushing/distressing. The dry brush technique usually looks better when there’s greater contrast between the colors and a stronger “edge” to each of the strokes. 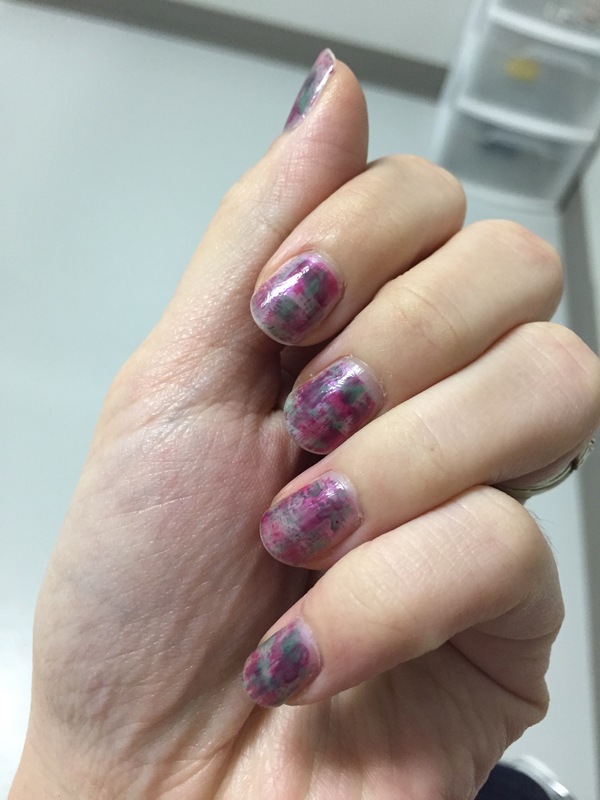 This just looks like some vaguely-80’s-ish watercolor pattern, or maybe an infection. 2. I didn’t go all the way to the edge and sides of the nail bed!! 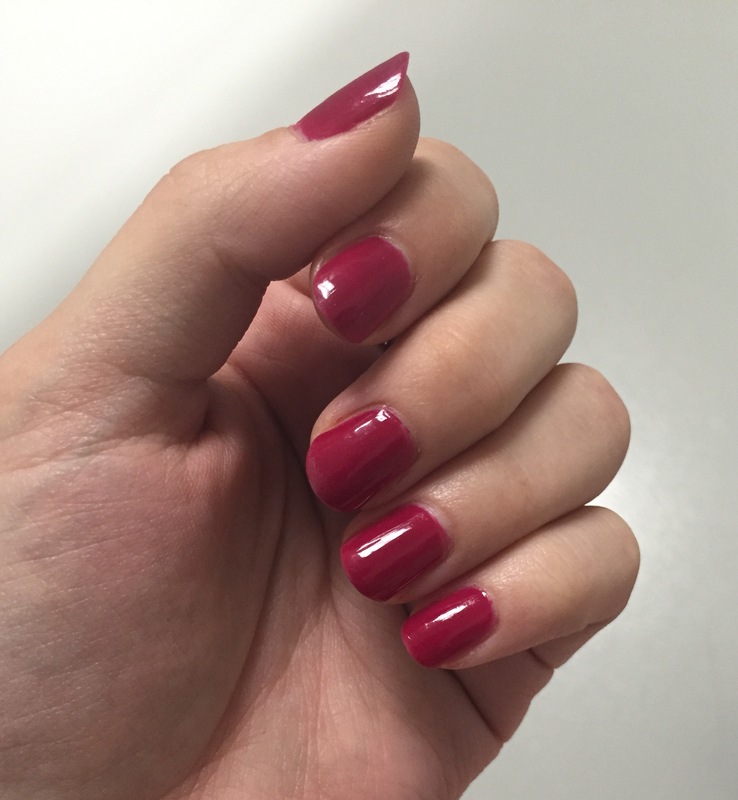 The left hand (first picture) doesn’t look so bad, but on the middle three fingers of my right hand I didn’t go to the sides of the nail and it looks weirdly unfinished. Sort of like I stained my nails or made a mess with art supplies. 3. Sheer/barely noticeable background color. I don’t think this one would be so bad is I had used a more prominent color for the brush strokes, but I didn’t, so it was. 3.5. Inconsistent ‘loading’. Some of the blobs had too much polish and lost their shape, some had too little and barely showed up, and it was just way too much work to get them to look even. This one is only a half point because it goes with the sheer polish problem – had I used something more opaque I would not have needed to work so hard to get it to show up. Bah! Two coats of Sinful Colors Ruby Ruby over one coat of Revlon Quick Dry Base Coat. I used two coats of NYC Grand Central Station as a quick drying topcoat; it’s not technically a topcoat, but it works pretty well as one anyway. Also, it’s under $2 USD so the price is RIGHT. Photo below is after two days of wear. I’m pretty hard on my hands, so this level of tip wear is okay with me. 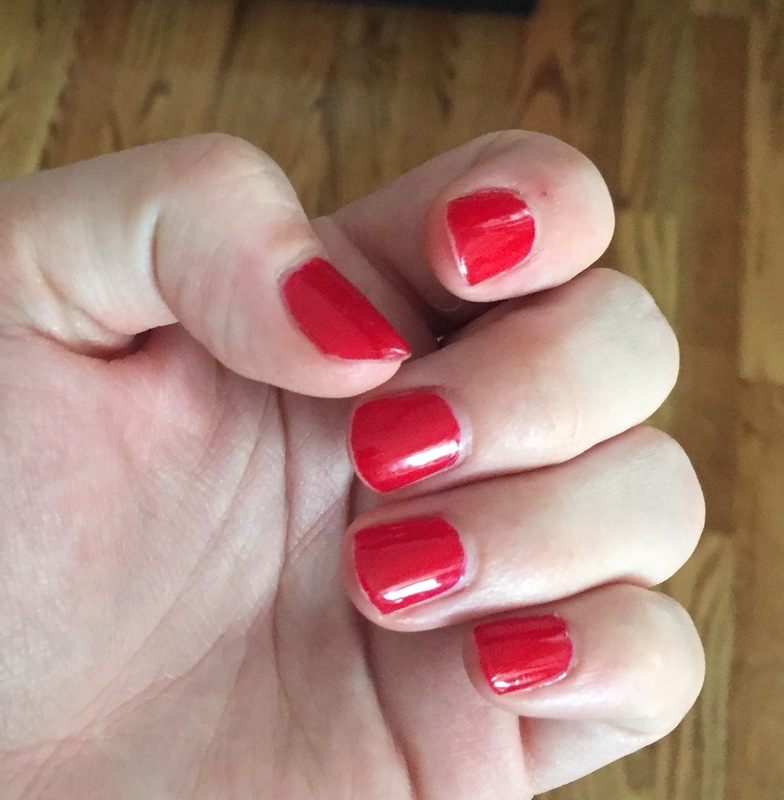 The whole manicure lasted most of a week, which is pretty darn good imo. Ruby Ruby is a cherry red jelly. I have nubs right now so it’s hard to see, but this polish will leave VNL. 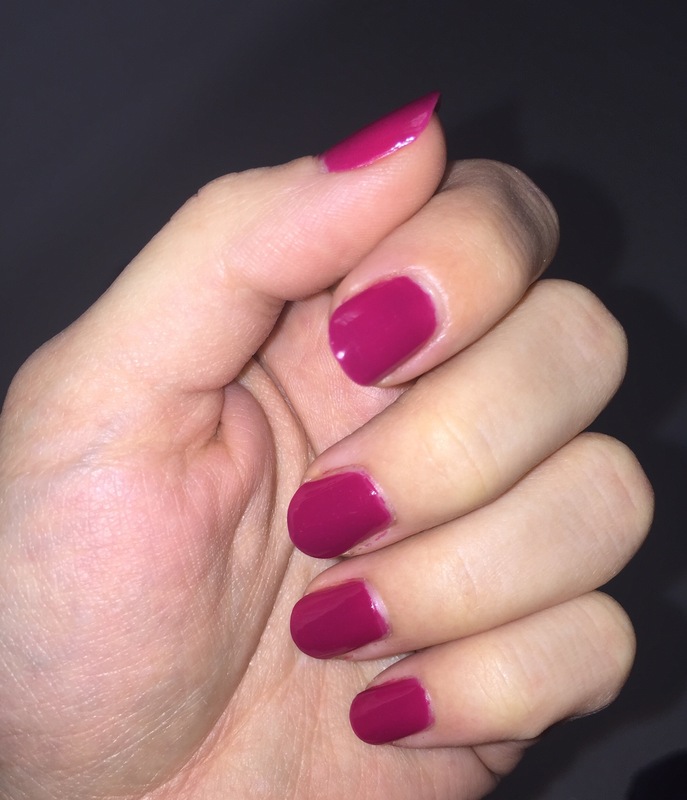 A single coat will be a sheer, almost neon dark pink. It actually levels out pretty well, so I didn’t have any problems with streaking or unevenness. For a 1-2 dollar polish I like this a lot! Not too shabby, Sinful Colors. Return from the dead and link to a sweet giveaway! OH HEEEEEY! I haven’t posted in almost a year, and it’s been a huge year for me. I’m now a parent and haven’t had the inclination or time to do fun makeup as much as I used to, so I’ve slowly transitioned to focusing on skin and lips to compensate for a lack of time to do fancy pants eyeshadow and liner. This was done last Friday; I finally took a day off from work because I had been feeling tired and awful all week. This was an awesome way to cheer up, much like the fantastical song for which it was named. 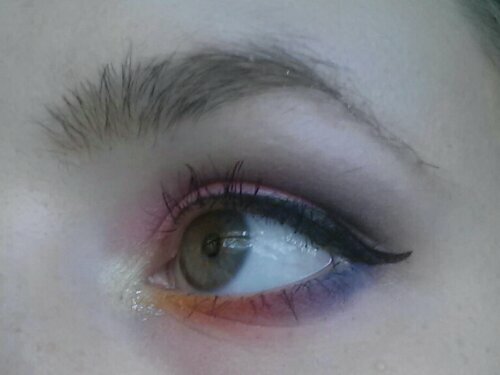 I loved wearing this and I’m hoping I’ll keep ballsing my way back to this sort of makeup. I really miss it!